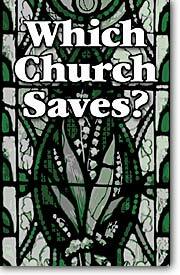 Home > Articles > Which Church Saves? "Do I have to become a Protestant to be saved?" "Not at all! I wouldn't waste my time trying to convert you to Protestantism." "But you don't believe that the Catholic Church can save, do you?" "Well, I am a Roman Catholic and my friends are members of the Greek Orthodox Church. You say that neither one can save, and you are a Protestant. Don't you want us to turn Protestant also?" "No, I don't. I have never asked any Catholic to become a Protestant." "You haven't! I don't understand. Don't you believe that Protestantism can save?" "You don't! What then--? How can one be saved? "Neither the Roman Catholic, the Greek Orthodox, or the Protestant Church can save your soul. No church can save, but the LORD JESUS CHRIST can." "That's right: one is not saved by a Church, either Catholic or Protestant, but through a person - the Lord Jesus Christ, God's only begotten Son." "Can it be possible? I've never heard this before!" "You see, it would do you no good to become a Protestant, for there are thousands of Protestants who are not saved; there are thousands who have embraced Christianity, but have never accepted the Christ of Christianity personally as Savior." "Is that why we have not found peace? Is there no peace in Catholicism?" "No, there's not - and none in Protestantism either. Peace is only found in Jesus. Religion cannot save; Christ alone can." "Nor is there salvation in any other [Protestant, Catholic, or other], for there is no other name under heaven given among men by which we must be saved" (Acts 4:12). "Is that the only Scripture that says this?" "You shall call His name JESUS, for He [not the Catholic priest nor the Protestant minister, but He - Jesus Christ] will save His people from their sins." "I've been trusting the wrong things! What should I do?" "Believe on the Lord Jesus Christ, and you will be saved" - "as many as received Him, to them He gave the right to become children of God, to those who believe in His name" (Acts 16:31; John 1:12). "But are you sure that He will receive me?" "Jesus Himself said, 'the one who comes to Me I will by no means cast out' (John 6:37)." "through faith... not of works" (Romans 5:15; Ephesians 2:8-9)." "Trust Him - and only Him - now as your Savior and Lord, for He will have mercy and abundantly pardon (Isaiah 55:7)." "When you do this, you will not only be saved, but you will be a member of the only Church the Bible knows - the Body of Christ (Ephesians 1:22,23; 1 Corinthians 12:12,13), of which Christ alone is the Head (Colossians 1:18). The Lord Himself adds to this Church daily those who are saved (Acts 2:47)." Jesus says, "Most assuredly, I say to you, he who hears My word and believes in Him who sent Me has everlasting life, and shall not come into judgment, but has passed from death into life" (John 5:24). "For by grace you have been saved through faith, and that not of yourselves; it is the gift of God, not of works, lest anyone should boast." (Ephesians 2:8-9).